How many of the logos can you identify? A digital studio called Hello Velocity has created a typeface that embraces well-known corporate logos and is still somehow far less annoying than Comic Sans. The studio says it creates "thought-provoking internet experiences," and its Brand New Roman font is a clever statement on consumerism. Each letter and number draws from a corporate logo, and much of the branding will be instantly recognizable for many of us, highlighting just how ingrained these companies are in our day-to-day lives. In fact, identifying each of the 76 logos makes for a fun game. The lowercase "a" is obviously Amazon's branding, and the zero is Target's logo. In between, you'll see branding from Disqus to Disney, Reece's to Rockstar Games, and Monster Energy to McDonalds. Typing a double "d" gives you the Dunkin' Donuts logo, while Hello Velocity snuck in its own branding in place of "hi." If you'd like to download the font, it might be best to hurry -- companies that are protective of their branding may already have their corporate lawyers drafting cease and desist letters. 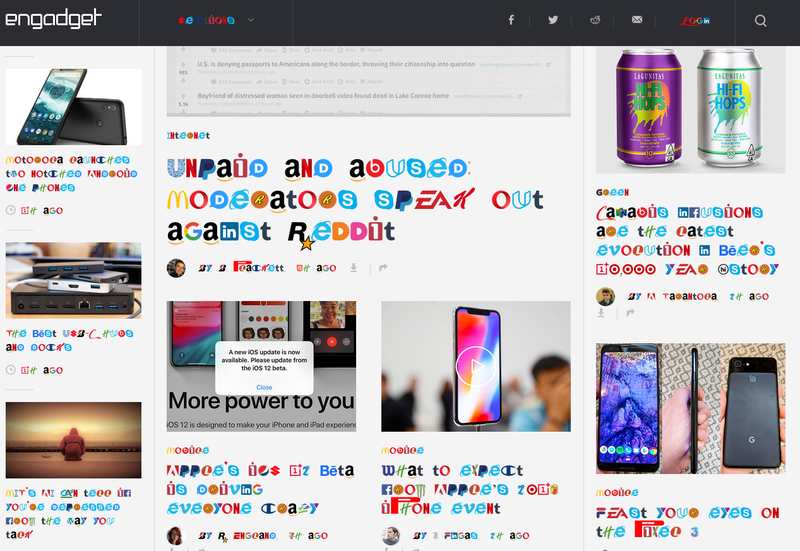 You can also install Chrome or Firefox plugins that turn entire webpages into a logo-filled experience, but given how Engadget's homepage looks with the font, that's maybe not the best idea.